If cared for properly, your fine quality sterling silver jewellery will last a lifetime. Sterling tarnishes naturally and requires occasional cleaning. Proper storage, care and cleaning of your silver will ensure your pieces last. Sterling silver tarnishes through a process called oxidization: a dulling that naturally occurs when silver reacts with sulfur or hydrogen sulfide in the ambient air. Care should be taken to prevent tarnish build up whenever possible. Sterling silver pieces should not be left out to the air long term. Proper storage of jewellery is recommended. Keep pieces in sealed plastic bags or jewellery boxes to slow the tarnishing process. To help prevent scratches and other damage, store pieces separately. Avoid exposing silver to household chemicals when cleaning, especially bleach and ammonia. Swimming in chlorinated water may also cause damage. Remove jewellery before swimming, bathing and sleeping. Jewellery that has tarnished can easily be cleaned with a treated polishing cloth or a simple homemade cleaning solution. Though they claim to be safe and effective, tarnish remover dips are NOT recommended. The chemicals in these dips can eventually change the silver colour, and damage stones and pearls permanently. Keep a silver polishing cloth in your jewellery box – this will allow you to give pieces a quick buff before wearing. 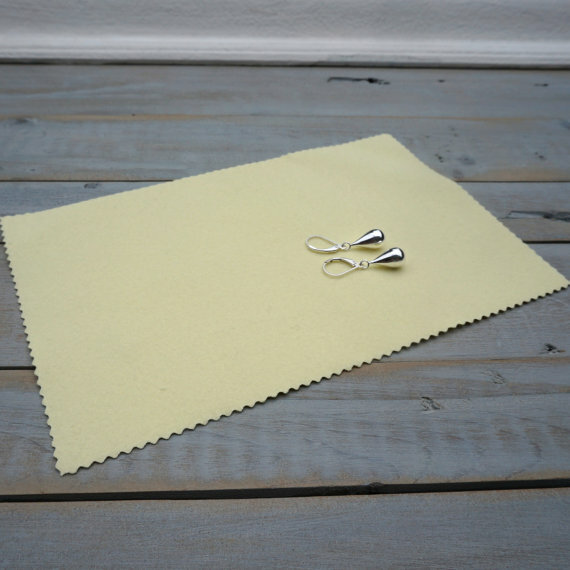 Bellabagu recommends the Sunshine® Polishing Cloth: a non-staining, easy to use, treated cloth that removes tarnish and leaves a deep, long lasting luster. Keep your Bellabagu and all of your jewellery looking it's best by using your polishing cloth at first signs of tarnish. Sterling silver reacts with moisture to create a layer of tarnish or oxidation on its surface. A simple, organic way to deep clean and polish your sterling silver jewellery can be found in your kitchen! Baking soda activated by boiling water in the presence of aluminum, will dislodge the tarnish by making it bind with the aluminum, leaving the sterling silver clean and shiny again. Jewellery will now be bright and shiny! Please enjoy your Bellabagu!